Magnetic bearings do not function on their own; they require multiple components working together as a unique system. Calnetix has designed and developed all of the components that make up the magnetic bearing system, and these components are shown and described below. The actuator in an Active Magnetic Bearing (AMB) is the electromagnet that applies a controlled force to the shaft of a machine to control its position. A radial actuator consists of a lamination stack with control coils and poles arranged to give two orthogonal axes of control. An arrangement of permanent magnets is also used in Calnetix actuators to produce a linearizing bias flux. Other AMB manufacturers produce the linearizing flux with a DC current in the control coil. Two other common actuator configurations are a combination radial/axial actuator and a stand-alone axial actuator. An AMB actuator must be connected to an Magnetic Bearing Controller (MBC) that supplies the control current to the coils based on a position sensor feedback signal and a control algorithm. A position sensor is a device capable of sensing shaft displacement (position) with a wide bandwidth. In Active Magnetic Bearings (AMB), information from the position sensors is used by the Magnetic Bearing Controller (MBC) to control the actuator coil currents , and thus the magnetic force on the shaft. Most often the position sensor will include a sensor head (transducer) in the machine adjacent to the magnetic actuator and drive/demodulation electronics in the MBC. A speed sensor is a device capable of measuring rotational speed of the shaft about its spin axis. 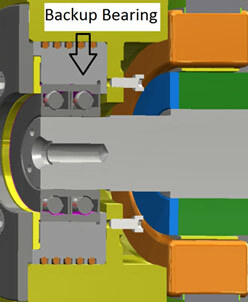 Information about the shaft speed is used by the MBC to ignore the synchronous component of the shaft position variations, thus allowing the shaft to spin about its center of mass. This feature minimizes transmission of the shaft vibrations due to unbalance to the housing of the machine and reduces the load on the magnetic bearings. A necessary component of a magnetic bearing system for a turbomachinery rotor is an auxiliary or backup bearing system. The backup bearings provide support for the rotating assembly when the magnetic bearing system is deactivated. The backup bearings also provide rotor support in the event of an overload of the magnetic bearings or a failure of some component of the magnetic bearings. In normal operation, the backup bearings are not active as they will have a small radial and axial clearance to the rotating assembly. This clearance is at most one-half of the magnetic bearing air gap and typically considerably smaller. There are several different backup bearing configurations that are practical for magnetic bearing systems. The most common configuration used by Calnetix is two duplex pairs of angular contact ball bearings preloaded face-to-face (DF). This mounting requires the bearing outer races to be clamped – either hard or through a spring – on the outer race. Hybrid bearings with conventional SAE 52100 steel races and SiN3 balls are standard. Backup bearings for high-speed applications are usually cageless and use either a grease film, dry film lubricant or a light grease fill. In a horizontal machine with a properly designed backup bearing system, the rotor motion in the backup bearing clearance space will be a rocking or pendulum motion if the unbalance forces are low relative to the static load. Forward whirl can occur if the unbalance forces are higher than the static load or if there is a large thrust load. In a vertical machine, the rotor motion will almost always be a full whirl around the clearance space. The whirl frequency typically locks to the lower of either the spin frequency or the lowest natural frequency of the housing or support. Since the load reacted by the bearings of a rotor whirling at a particular frequency will vary roughly with the square of the whirl frequency, it is desirable to keep the whirl frequency low. This is the key motivation for including compliance in the backup bearing support. A destructive backward whirl of the rotor around the clearance space can be triggered by excess friction – usually from rubbing or by very large bearing loads. Calnetix Technologies has developed and deployed advanced Magnetic Bearing Controllers (MBCs) that contain all of the elements necessary to operate a magnetic bearing system. 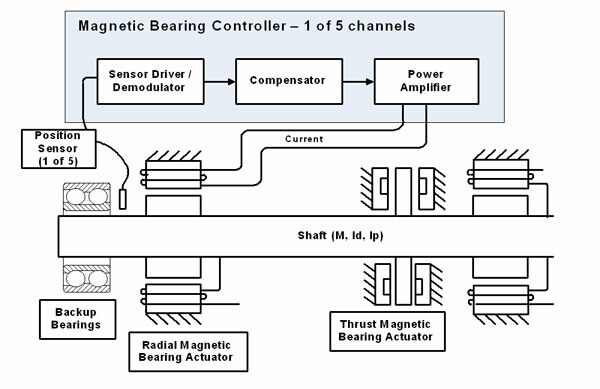 The very simple rotor and magnetic bearing system shown in Figure 1 shows the basic relationship between the MBC and a machine rotor supported on Active Magnetic Bearings (AMB).The components of an AMB system in the machine are the electromagnetic actuators – often thought of as the bearings – and the position sensors. The actuators and sensors are connected to the MBC through cables. The actuators, sensors, MBC and connecting cables form the AMB system. The key components of the MBC are outlined in the dotted box of Figure 1. The Digital Signal Processor (DSP) board has a sensor electronics section that drives the machine mounted position sensors and demodulates (detects) the return signal. The DSP executes a control algorithm (the compensator) and produces a command signal for the power amplifiers. The control program in the DSP also handles levitation logic, fault and trend monitoring and diagnostic functions. The amplifier board converts a command signal from the DSP to drive a control current through the AMB actuator coils. Figure 2 describes the basic operation of the magnetic bearing control loop. 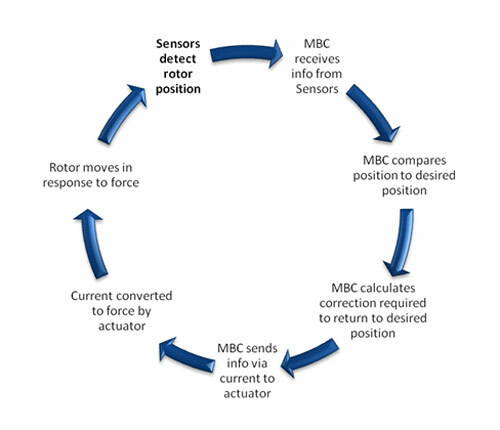 When the rotor moves or vibrates in response to some force – whether control force, external force, or unbalance – the position sensor detects the motion and converts it to a voltage with the help of electronics located in the MBC. The sensor voltage is read into the Digital Signal Processor (DSP) – the brain of the MBC. The DSP compares the rotor position to the set point or desired position to determine the error – this is the value the control loop will try to minimize. The required correction is calculated from the error using a compensator algorithm. The correction (command) is sent to the power amplifier to drive the required current through the AMB actuator coils. The actuator converts the current into an electromagnetic flux, which creates a force on the rotor. The motion or response of the rotor to the control force, and all external forces are governed by the rotordynamic characteristics of the machine. An AMB system produces stiffness and damping forces that control rotor position. In contrast to the mechanical or fluid forces provided by conventional bearings, magnetic bearing forces are produced by a magnetic field at the actuator surface. The AMB produces reaction forces opposing the rotor displacement (stiffness) and also reaction forces out of phase with rotor displacement (damping). The variation of magnetic bearing stiffness and damping with excitation frequency is defined primarily by the compensator transfer function. The compensator – together with the characteristics of the position sensor, MBC power amplifier and magnetic bearing actuator (electromagnet) – define the stiffness and damping characteristics of the magnetic bearing system. The compensator is created by Calnetix control engineers using the rotordynamic model of the machine and dynamic models of the AMB components. The characteristics of the magnetic bearing compensator, fault limits and operation options are defined in a parameter file (also called design file). This file is compiled by Calnetix to create an image that can be stored in flash on the DSP board in the MBC. Machine specific characteristics, such as sensor calibration values, operating hours, fault log and event log are stored in Non-Volatile RAM on the DSP board. Calnetix currently produces three different MBC platforms in the Insight™ series. MBCs are classified by amplifier reactive power – for instance the Insight™ 3600 has amplifier capacity of 3600 V-A per channel. As machine size or dynamic force requirements increase, the required amplifier capacity increases. The DSP board and sensor electronics are the same across all MBC platforms regardless of size or speed of the machine. Of course, the control algorithm (compensator) is different for different machines, so the parameter file that defines the compensator is installed in the MBC flash memory using the Calnetix Service GUI. The two Calnetix MBCs are shown below. Although there are similarities between magnetic and conventional bearings, the use of active control allows a magnetic bearing system to incorporate many desirable features that are just not possible for conventional bearing systems. Some examples of the many features available in all of the Calnetix MBC are discussed below. During the operation of the AMB and the machine, the MBC constantly monitors key variables – including position, current, temperature, and others – to ensure that the machine and the AMBs are operating as desired. Limits for these variables are established by discussion between Calnetix and the customer. Most variables have two limits – a warning level and a fault level. Many of the faults are filtered so that the fault condition must persist for a certain amount of time before a fault is issued. When a limit is exceeded for the specified amount of time, either a warning or fault is issued so that the customer’s system control can take appropriate action. The MBC stores two separate history logs to non-volatile memory – one for key events and one for faults. Both logs include time/date stamps, spin speed and other key data. Typical events that are included in the Event Log are: Levitate, Delevitate, Rotation Start & Stop, Sensor Calibration, Parameter File Update, Firmware Update, Rotor Drop, Drop Counter Reset, Run Time Counter Reset, and Power Up. There are also five data buffers that record a brief time history of key data items whenever a fault is generated while spinning. These data buffers data are recorded to non-volatile memory and can be used for troubleshooting should a fault happen during operation. Customer interaction with the Calnetix MBC is through a Digital I/O interface and/or a serial communication interface. The Digial I/O interface is a hard wired, opto-isolated interface with four inputs and four outputs. Typical inputs are external levitate and fault reset. Typical outputs are levitated ok (drive enable) and warning. The MBC has two serial communication ports. One is for the Calnetix Service GUI (Graphical User Interface), and the second is a User interface port. The user port provides selected register access for a user developed PLC system controller using standard Modbus commands. This allows interface allows a user to request operating status and data as needed. The Calnetix Service GUI is described in more detail below. Since AMB systems apply actively controlled dynamic forces to the rotor, they can do more than just supply stiffness and damping. One of the most important and unique features of AMBs is synchronous cancellation. This allows the AMB to significantly reduce the effect of mass imbalance on the system. There are many different methods and approaches used by various vendors and researchers, but they are all generally aimed at suppressing either synchronous forces or synchronous displacements. In industrial machines, it is most common to use cancellation to reduce synchronous forces since this reduces transmitted vibration to the machine housing, reduces actuator power and reduces dynamic load requirements. This type of cancellation also goes by names, such as Automatic Balancing Control (ABC), Adaptive Vibration Control (AVC), Adaptive Vibration Rejection (AVR), and Unbalance Force Rejection Control (UFRC, is the generic term used by ISO 14839-1). The cancellation signal for UFRC can be determined by adaptively multiplying the synchronous signal by a suitable influence coefficient matrix (developed either analytically or by measurement). This approach is required for the traverse of the rotor rigid body modes and can be used for higher speeds as well. For speeds above the rigid body mode frequencies, UFRC can be as simple as adaptively subtracting the measured synchronous displacement from the sensor signal before presenting it to the controller. With no synchronous component in the control signal, the controller produces no synchronous current and therefore the rotor spins about its inertial axis. In some types of machines, such as machine tool spindles, it is important to reduce synchronous displacements. Here, a rotating force is added by the magnetic bearing with an amplitude and phase that will reduce the synchronous displacement to near zero at up to two axial locations on the rotor. For a machine tool, one of these points will be at the tool tip. This type of cancellation also goes by names such as peak of gain control, Adaptive Vibration Control (AVC), and Unbalance Force Counteracting Control (UFCC is the generic term used by ISO 14839-1). There are also approaches to supply synchronous damping to assist the traverse of a bending mode in a supercritical machine. This is has been called Synchronous Damping control (SDC) and Optimum Damping Control (ODC). Another unique feature of magnetic bearings is the ability to selectively change the stiffness and damping characteristics of the bearings as a function of spin speed. This can lead to more robust control for machines with significant gyroscopic effects. Although spin speed is the independent variable that is typically used for gain scheduling in industrial machines, other variables available to the controller can also be used if necessary for a particular design problem. For instance, in a machine with significant fluid film forces associated with a compressor or turbine, pressure ratio can be used as the gain scheduling parameter to improve performance. 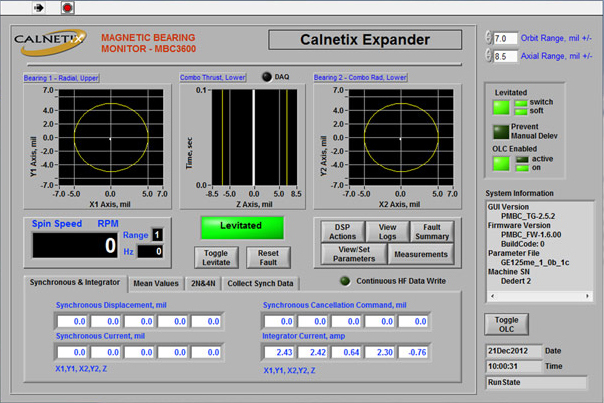 The Calnetix Service Graphical User Interface (GUI) provides an intuitive and comprehensive interface into the magnetic bearing system. The GUI is used for system setup, monitoring, diagnostics and system identification. The front panel of the GUI is shown below. The upper half of the front panel shows orbit plots from the two radial bearing sensors and a time history plot from the axial bearing sensor. Other operating variables shown include spin speed, static current, and synchronous displacement and current. Status variables, such as levitation and fault status are indicated as well. A System Information window on the right gives version information for the GUI, firmware, parameter file and machine serial number specifier. The GUI can retrieve the History Logs (fault, event, ESD data) recorded by the MBC as well as machine specific calibration and system data stored in non-volatile RAM. The GUI can be used to set up and retrieve internal high frequency measurements by the MBC. This feature provides high data for of key operating signals, such as rotor motion and coil current (actuator forces). The GUI can also set up continuous, long-term recording of high-frequency data (position, current, speed) for disk storage.